In years past, we've undertaken to make larger and larger snowmen. It's gotten to the point where we can no longer lift the midsection of the snowman onto its base, so we've abandoned the Frosty idea this year (so far) for a less humble project. We're making an igloo from the remnants of the boys' forts. If you are archaeologically-minded, you can investigate the ruins of the original forts in the photo above. Calvin' appears in red, Gabe's in blue. 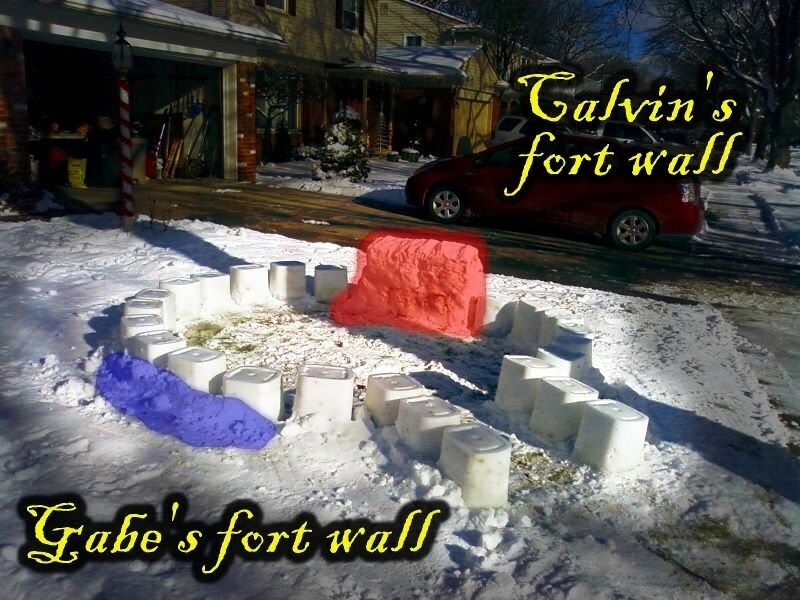 Gabe's fort had become known as "Tumble Mountain" because the name aptly describes how Gabe chose to utilize his fort. I had always suspected he had great destructive capabilities, but until I watched him tumble down Tumble Mountain, I wasn't able to quantify them. The igloo does not require lifting a 200lb snowball. It's a construction of several 4-Gallon sized snow blocks. With the extreme cold weather we've been having, the snow blocks can be quickly constructed from snow and water. Stay tuned for more 2010 Igloo photos as they come available. Hopefully the cold weather will last long enough to finish this monumental project.